As Secretariat for the All Party Parliamentary Group for Tibet we work closely with MPs who have a special interest in Tibet and help devise strategies to keep Tibet on the political agenda. This is the “gateway to government” for all the Tibetan organisations in the UK and it has a genuinely international significance for the Tibetan movement. We are arranging meetings for Tibetans to give testimonies to MPs and Foreign Office officials and we are developing our MP exchange programme which fosters relations between British and Tibetan exiled parliaments. Such visits strengthen support for Tibet in Westminster and help the exiled government with developing democratic processes. 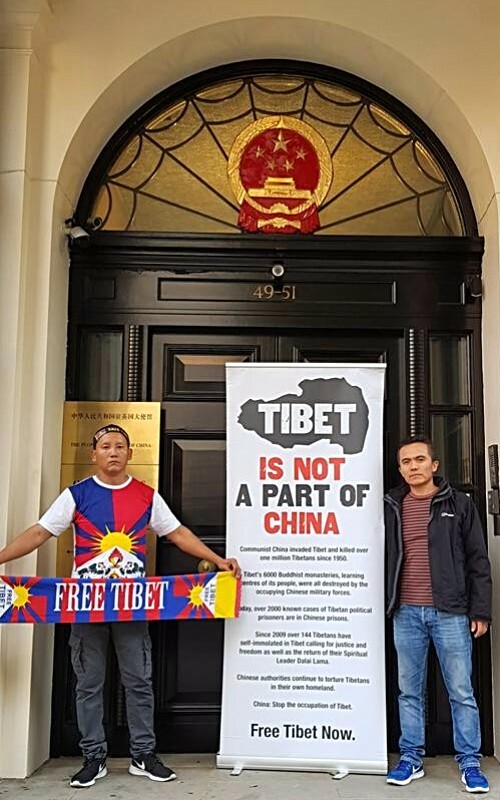 Unfortunately, Tibet Society cannot qualify for charitable status because our core aims, such as supporting self-determination for Tibetans, lobbying governments, and protesting about human rights abuses, are classified as political by the Charity Commission. That shuts off many potential sources of income and makes us much more dependant than other Tibet groups on our members and supporters for funding. With your help Tibet Society has ambitious plans to deliver a great deal over the next 12 months, but we need your support. Every donation, even the smallest, makes a huge difference to our vital ongoing campaign and lobbying work. Thank you for standing in solidarity with the Tibetan people in their struggle. You can donate today via Paypal. Please pay “Tibet Society” – Account no: 65319749, Sort code: 08-92-99 (The Co-operative Bank). This summer, Liverpool Football Club has entered into partnership with Tibet Water Resources Ltd (TWRL) as it’s official regional water partner in China. 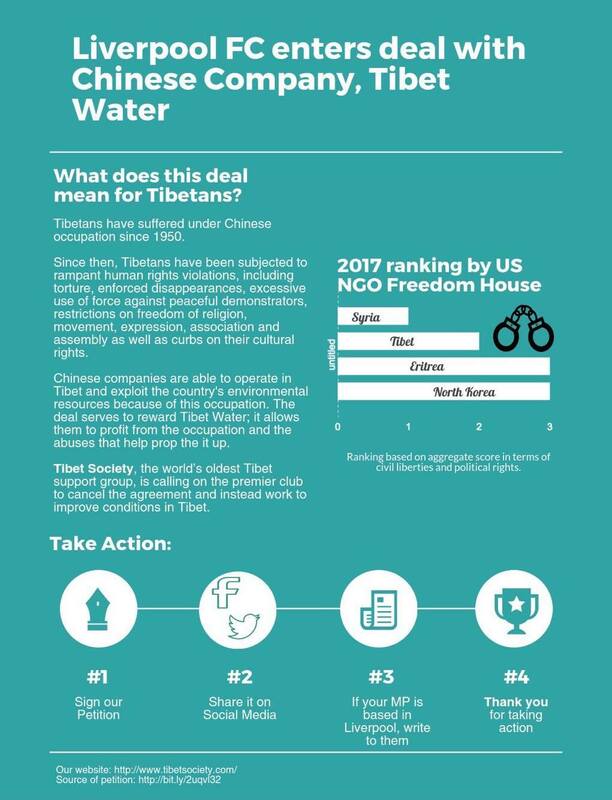 Tibet Society have raised a petition and are campaigning against this deal. You can find a link to our online petition on our website and our Facebook and Twitter feeds. Urgent action is required to stop Liverpool FC and halt deals with Chinese companies that exploit the occupation of Tibet and damage the fragile Tibetan environment. We urge you to be a part of our campaign by donating to Tibet Society and signing the petition. Please consider making provision in your will for a bequest to Tibet Society. The need for financial help has never been greater. Tibet has suffered enormously since the annexation of the country by the Chinese government in 1959, when the Dalai Lama was forced to flee across the border into India, where he remains to this day. Sadly, there seems to be no day in sight when our help and campaigning will not be needed so any legacies for the future would be greatly appreciated. 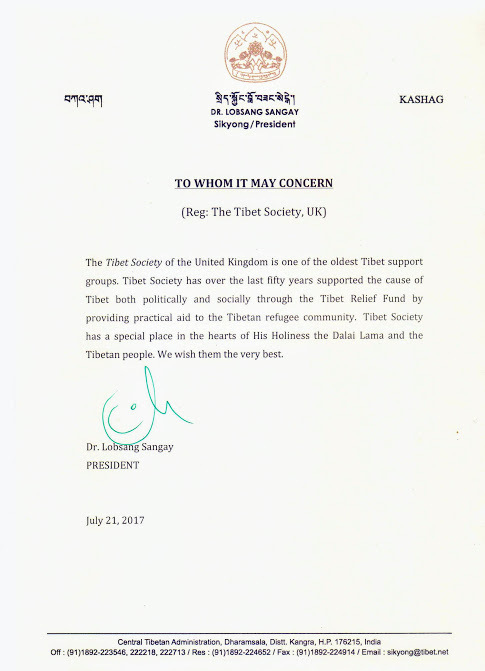 Join Tibet Society – TODAY! Founded in 1959, within weeks of the flight of the Dalai Lama from Tibet following the uprising against China’s occupation, Tibet Society became the world’s first ever Tibet support group. Today, Tibet Society continues to work for the freedom of the Tibetan people and their right to self-determination. This entry was posted in Tibet, Tibet News, Tibet Society Update and tagged 2017 September Tibet Society Update. Bookmark the permalink.